Since childhood, I love painting, especially watercolor painting. I was so fascinated with its transparency, smoothness, liveliness, colorfulness and harmony that I couldn't live without drawing even for a single day. To an artist, painting is as a matter of fact a process of creating beauty. To reach this objective, an artist must give scope to his initiative and all his senses to involve himself in nature so as to bring it out in his works. Nature contains numerous secrets and mysteries, colorful, charming and splendid. Therefore, to express it, we must love it and only through an attentive observation, emotional description and an unceasing exploration, can we then have the possibility of expressing its enchanting charm. It is not an easy job to draw a succinct, simple and skillful painting, therefore to obtain this objective, an artist has nothing to do but to embrace different arts to enlarge his knowledge, enhance his cultivation and elevate his quality for without cultural accumulationn and assiduous practice, it is impossible to turn out good paintings. Besides, hard work, as an artist, he should be good at learning from his predecessors by analyzing and learning the best of their works and trying to find out its uniqueness. For a good piece of artisc work, we should analyze attentively its structure and color to the background it depicts to understand the painter's endeavor and intention. Only by studying more and practise more, can we improve ourselves and lay a solid foundation for a new target. I will continue to try my best to depict nature with my painting brush. If you are interested in my paintings let me know thru the e-mail address that you can see on the top of every web pages. Most of them are available for display in art gallery and some of them are of course for sale. Liu SuiSheng, associate professor of fine art at the College of Architecture & Civil Engineering of Inner Mongolia Polytechnic University (formerly IMEC). He graduated from Inner Mongolia Engineering College (IMEC) in 1982. Since 1990, more than 100 of his paintings and 10 papers have exhibited or published in periodicals both at home and abroad, of which many won prizes and were collected by museums and private collectors in many countries. In 1997, his painting Spring Joy gained the honour of acceptance in the First Chinese Art Competition in AmsterdamÃÂ1ÃÂ¤7 and his Small Bridge gained a silver medal in the 2nd Best Paintings Competition. In 1998, his Magpie and Twilight were collected by the 8th World Arts Exhibition in South KoreaÃÂ1ÃÂ¤7 and his HerdingÃÂ1ÃÂ¤7 Cattle also won the prize of the 8th Nation-wide Artists Competition. 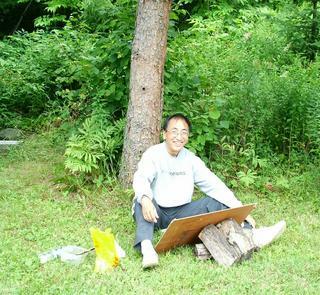 In 1999, River in Mountain won the first prize of the 3rd Inner Mongolia Watercolour Paintings competition and his painting Mongolian Yurt in Alasan League won the gold medal of the International Famous Modern ProfessorsÃÂ1ÃÂ¤7 Works Exhibition. From 1999 to 2000, his works were printed twice on post cards by the Ministry of Post and Communications. In the year of 2000, Grassland Serials 1 received the bronze medal in the World Chinese Artists Works Exhibition and gained formal recognition from the Chinese Culture Ministry. In 2002, Farm Gained a bronze medal in Huston World Peace Art Exhibition. Liu Suisheng boasted the honour of an Outstanding Artist in China and Famous World Artist and was honoured with the title of Famous Artist in Calligraphy and Painting.